I first became interested in geology at a very early age after many summer days rummaging around on the south coast of the UK looking for fossil and mineral specimens. Studying geology at A-Level confirmed my desire to choose a degree in geology. Without my time at the University of Southampton I do not think I would be where I am now, and I am very proud to say that I was part of the 2005 Master of Geology family. I would recommend, and have recommended, Southampton to anyone with an interest in geology. The University of Southampton has a friendly atmosphere created by fellow students and staff and excellent facilities both educational and recreational. Several first year field trips really get you stuck in the geology, with weeks in Wales and Yorkshire. Moving into the second year things advance very quickly, challenging subjects and trips further abroad to Spain brought my year closer together. The second year concludes with a tough mapping course to Anglesey as preparation for a six-week mapping exercise in the summer break. Arriving back at University to start the third year, it seemed like time flew by. Later that year, I was awarded the Hodgson-Najoan Prize for producing the department's best mapping project, and also achieved second place in the national mapping competition run by The Geological Society of London. During my degree we had a guest lecture from Anglo American as part of our mineral/petroleum resources module, and were invited to speak to them individually about careers in general. After a short grilling, and another interview in London a few days later, I was ecstatic when I discovered I was to be offered a three-month summer placement in South Africa. 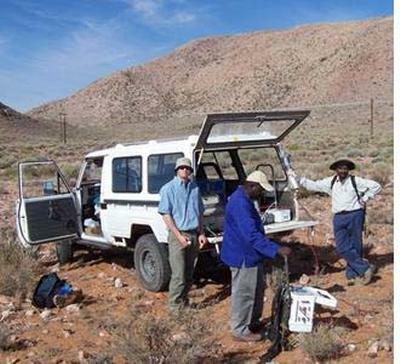 During the placement I worked for both the exploration and mining side of a Cu-Pb-Zn operation in a remote part of northwest South Africa. During my time there I mapped a large section of a deposit as part of my final year project. This proved both extremely challenging and enjoyable; avoiding snakes and scorpions whilst looking at rocks was a daily hazard! Returning to the University for the final year of my MSci, the research project proved the most rewarding of all my years at Southampton. Having built a rapport with many staff through the department, many seemed like old friends rather than lecturers. This made everything far more enjoyable. Around Easter, Anglo American again called me in for a second interview with permanent employment in mind. Two weeks later I was offered the job; the phone call came about 30 minutes before I was due to present my the results of my research project to our entire year, and so any nerves for the presentation were wiped out in an instant. I was glad to come out top in my year with an Honours Master of Science degree in Geology. I think our whole year was extremely proud of our achievements, and we celebrated with a very wet BBQ on the NOCS dockside! 2011 Update - I left almost immediately from graduation to South Africa to start work in zinc exploration with Anglo American, with a new discovery on my first day life has been very interesting since. I was dropped right at the deep end, with a drilling project which finished in 2010 and over 70km of boreholes completed. I learnt a lot very quickly during the first year, geological, geophysical, geochemical and managerial. This experience has proved invaluable since. In 2008 I met my future wife to be in South Africa close to the project I was working on. After spending 6 months in the Democratic Republic of the Congo in late 2009 (during which my wife was planning our wedding on her own, something I don't think I'll ever be forgive for!) we got married in November 2009. Then in early 2010 I was told we would be moving to Peru! We moved here in July 2010, and I have been very busy exploring for copper porphyries since, we live in Lima and I spend a lot of time away from home at high altitude in the Andes (3000-5000m). It is extremely physical but rewarding work. Exploration geology certainly isn't for everyone, long hard days, remote locations, a real challenge, but for me it's the perfect job and without the experiences and teaching at SOES I wouldn't be halfway across the world enjoying every second of it!